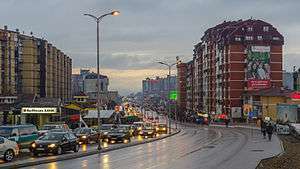 Bill Clinton Boulevard is a boulevard located in Pristina, the capital and largest city of Kosovo. [a] After the Kosovo War of 1998-1999, the Albanians in Kosovo wanted to thank U.S. President Bill Clinton for his help in their struggle with the government of the FR Yugoslavia. A 10-foot-high (3.0 m) statue of Clinton was unveiled on the boulevard on November 1, 2009, in a ceremony at which the former president spoke. Elsewhere in Pristina, Kosovo has named a central street after U.S. President George W. Bush. There are also several cities in Kosovo, including Prizren, with streets named after President Woodrow Wilson. ↑ "Kosovo unveils Clinton's statue". BBC. 1 November 2009. Wikimedia Commons has media related to Bill Clinton Boulevard.